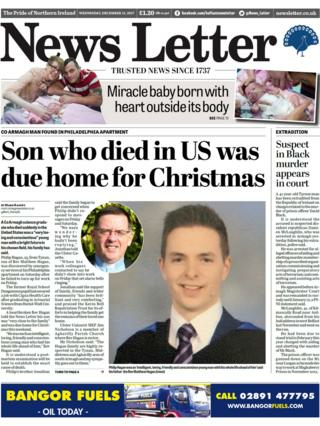 The sudden death of a 25-year-old County Armagh man in the US is the lead story in Wednesday's Belfast Telegraph and News Letter. Emergency services discovered Philip Hagan in his apartment in Philadelphia on Saturday after he missed work on Friday. Mr Hagan, from Tynan, was the son of the Rev Matthew Hagan. The Rev Hagan told the News Letter that his son was an "intelligent, loving, friendly and conscientious young man who had his whole life ahead of him". A post-mortem examination is to be carried out. The Belfast Telegraph carries the story of an Armagh man appealing for information about his sister's murder, 45 years after he discovered her body. Gerard Beattie, accompanied by a police officer, found the partially-clothed remains of his 18-year-old sister Marian Beattie in a quarry on 30 March 1973. She left a dance in Aughnacloy, County Tyrone hours earlier in the company of an unknown man. "I think it is an an absolute disgrace how the police have treated the case," Mr Beattie told the Telegraph. The Beattie family believe that Marian's killer must have known the area well and have appealed to anyone who may have taken pictures at the dance. The Belfast Telegraph also reports that Newry's "dismal" Christmas tree on Hill Street in the city has got itself a makeover. The paper gave the tree's rather sad appearance a half page of coverage earlier in the week. The Irish News brings us back to Brexit - its lead headline states: "Increased pressure on Britain as EU backs special Irish trade talks." According to the paper, the EU announcement that there will be a special section on Ireland in the EU's trade talks increases pressure on the UK. The paper's political correspondent John Manley says the move is a "reminder to London that difficulties remained to be solved in Ireland despite last week's agreement on a soft border". The Irish News also carries comments from the author of the book Nama Land, Frank Connolly. Mr Connolly believes more "sensational details" will emerge around the controversy surrounding the Republic's 'bad bank' next year. The Daily Mirror, meanwhile, reports on two so-called "runaround" cars being burned out in Belfast. The PSNI has hit out at the 'death-drivers' behind the incidents and appealed to people to think about the consequences before they sell cars to people likely to use them for criminal purposes.